A Montana cowboy was watching his herd on a pasture deep inside Montana's Little Belt Mountains when suddenly he sees a brand-new car emerge from a cloud of dust driving towards him. 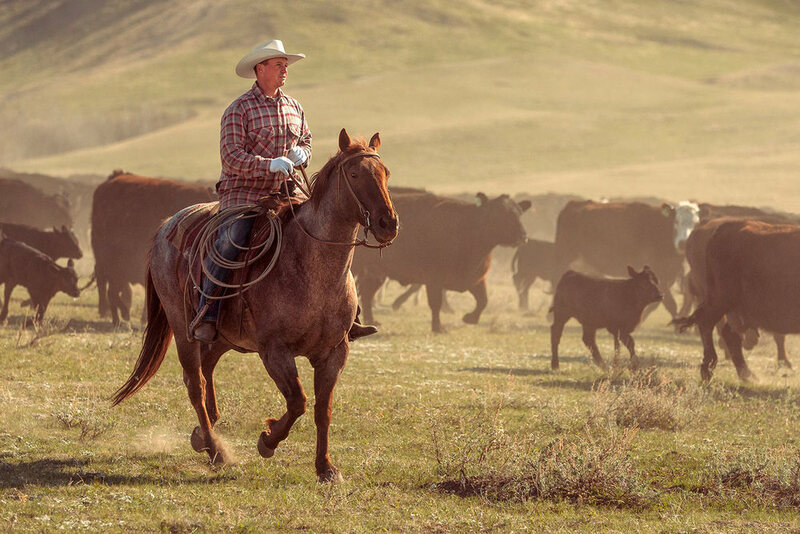 The driver, a young man in a fancy suit, polished shoes, dark sunglasses, and an expensive tie, stuck his head out of the window and asks the cowboy, "Say, if I tell you exactly how many cows and calves you have in your herd, will you give me a calf?" The cowboy took off his cowboy hat, wiped his dusty brow, then looked at his herd peacefully grazing and calmly said, "Sure, why not?" The man in the shiny new car and fancy suit then whipped out a computer, connected it to his cell phone, and surfed to a NASA page on the Internet, where then pulled up a GPS satellite navigation system to get an exact fix on his location, which he then fed to NSA satellite that scans the area and produces an ultra-high resolution photo. The young man in the fancy car then downloads that digital photo, uploads it to a super computer in Langley, Virginia and within a few seconds he receives a text message on his cell phone that the image has been processed and stored. Finally, he prints out a full-color, multi-page report on a miniature wireless printer. Then after a few more moments to crunch the data he finally turns to the cowboy and said, "You have exactly 1,756 cows and calves." "That's right," said the Cowboy. "I guess you can take one of my calves then." The cowboy watched as the young man selected one of the animals in his pasture and looks on as the young man stuffs it into the trunk of his shiny new car. The cowboy then says to the young man, "Hey, if I can tell you exactly what your business is, will you give me my calf back?" Bemused, the young man thinks about it for a second and then says, "Sure, why not? What business am I in, old man." "You're a U.S. government employee," said the cowboy. "Wow! That's correct," said the young man in the fancy suit. "But how did you guess that?" "No guessing required," answered the cowboy. "You showed up here even though nobody called you; you want to get paid for an answer I already knew, to a question I never asked. You tried to show me how much smarter you are than me; and you don't know a thing about cows. This is a herd of sheep.